For the 24 hours to 23:00 GMT, the EUR rose 0.05% against the USD and closed at 1.1349. On economic news the Euro-zone’s final services PMI slid to its lowest level in two-years to 53.4 in November, in line with market expectations. The preliminary figures had indicated a drop to 53.10. In the prior month, the PMI had recorded a level of 53.7. On the contrary, the region’s seasonally adjusted retail sales rebounded 0.3% on a monthly basis in October, more than market expectations for an advance of 0.2%. In the preceding month, retail sales had recorded a revised fall of 0.5%. Separately, in Germany, the final Markit services PMI eased to 53.3 in November, hitting its lowest level in six months and confirming the preliminary print. In the previous month, the PMI had recorded a reading of 54.7. In the US, data showed that the US MBA mortgage applications rose 2.0% on a weekly basis in the week ended 30 November 2018. In the previous week, mortgage applications had registered a gain of 5.5%. The Federal Reserve’s (Fed) latest Beige Book revealed that most districts witnessed a modest or moderate pace of expansion from mid-October through late November. Further, the report stated that labour markets tightened, and consumer spending held steady. On the inflation front, the Beige Book indicated that prices rose at a modest pace in most districts, although a few reported moderate increases. Moreover, the report signalled that the Federal Reserve will only gradually raise interest rates. However, uncertainty about trade remained a concern for manufacturers and farmers. In the Asian session, at GMT0400, the pair is trading at 1.1341, with the EUR trading 0.07% lower against the USD from yesterday’s close. 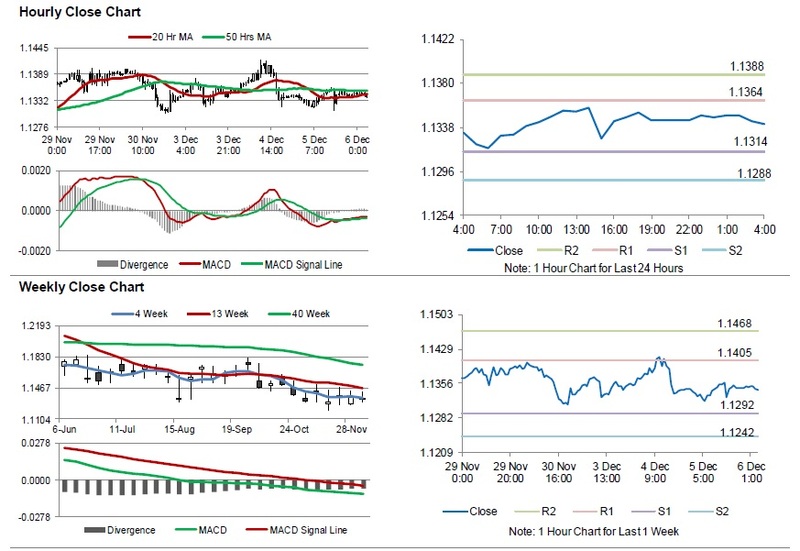 The pair is expected to find support at 1.1314, and a fall through could take it to the next support level of 1.1288. The pair is expected to find its first resistance at 1.1364, and a rise through could take it to the next resistance level of 1.1388. Going ahead, traders would keep an eye on the Germany’s construction PMI for November and factory orders for October, slated to release in a few hours. Later in the day, the US ADP employment change and Markit services PMI, both for November, will keep investor on their toes. Additionally, the US trade balance data, factory orders and durable goods orders, all for October, will garner significant amount of investors’ attention.